The voices in my head tell me I’m crazy and we tend to agree with them. This was my A race for the year. 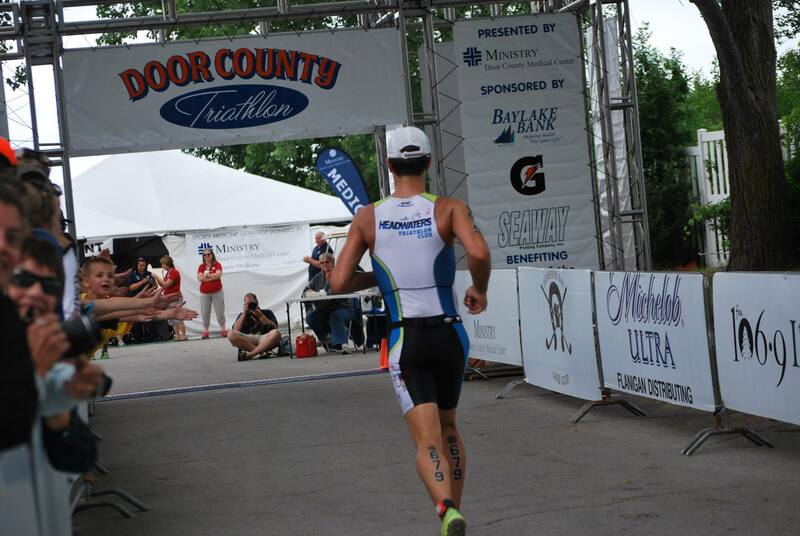 All of my focus went into executing at this race since the beginning of the year. I purchased The Triathletes Training Bible to help create a plan that was not only manageable but pushed me to improve myself. A result of this was less racing in the beginning of the season. Week leading up: I began to taper two weeks before the race, that meant that there was a large amount of restlessness in the second week of the taper. I felt ready to go but kept the workouts fairly short and based on race pace. Thursday the family and I traveled to Green Bay. It was a long drive but good to spend time with my support crew. Friday morning I went for a short run in the morning to try and loosen the legs up from the long car ride. Later in the day we went back in the car to get some supplies, I love Teavana Earl Grey Creme hot tea the morning of a race or hard workout. I also enjoy chamomile and mint tea the night before. Saturday we went up to Door County to watch the sprint race, recon the course, and enjoy the area. One opportunity for improvement that I have when going to races is to enjoy the local cafes and delis AFTER the race. We had a wonderful lunch in Egg Harbor, did some walking around the city, and drove the bike and run course so I could see the turns on the bike and experience the hills, somewhat, on the run. After the day in Door County we headed back to Green Bay for salmon, brown rice, and salad for dinner. Sunday, Race Day! Up and out the door at 4:15. Cheerios and granola with coconut milk for breakfast, I also made a peanut butter and honey sandwich for later and packed a banana. Made the drive up and the slow shuffle into transition. Since we were there early parking was quite easy, although there were assigned rack position so there was no benefit to being in transition early, it is habit though. Milled around for a bit, got body marked with the temporary tattoos, then headed back to transition to prepare my small corner. An hour before the swim was the peanut butter and honey sandwich. Sip coconut water throughout the final hour and get ready to go. 15 minutes before was a Gu gel. Nothing to eat on the swim and the only drink I had was when I turned my head and got water instead of air. I planned on swimming the 1.2 miles in 34:30. The bike was a GU gel after getting settled out of transition, I figured by mile 2, another at mile 10, 20, and 45. At mile 30 was my mostly solid food for the day, a LaraBar cookie dough bar. Mix water and coconut water throughout the bike with the intent of consuming between 45 and 60 ounces of water over the course of the bike ride. In training in cooler temperatures I felt pretty good coming off the bike with consuming that much water so I decided to go with it. My best guess on the bike was 2:35-2:40, I was really doubting my ability to bike the 56 miles at race pace. The swim was relatively as planned, we had to funnel through a shoot to “check in” to our wave. 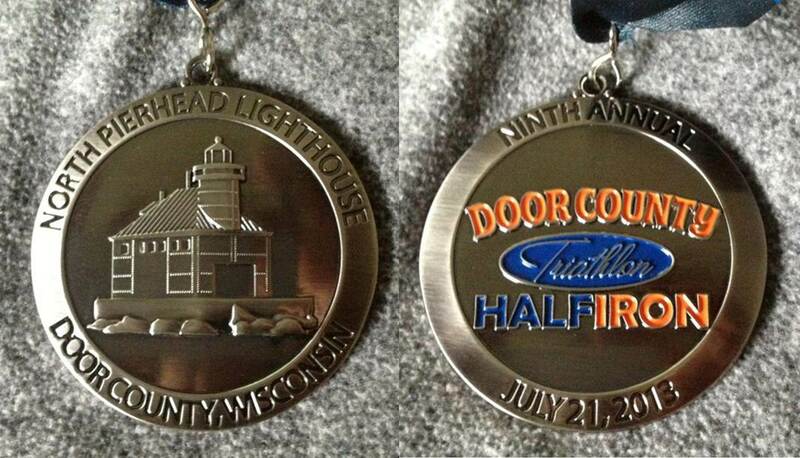 I was in wave 13 out of 15, the only age groups behind me were 40-44 & 45-49 males. 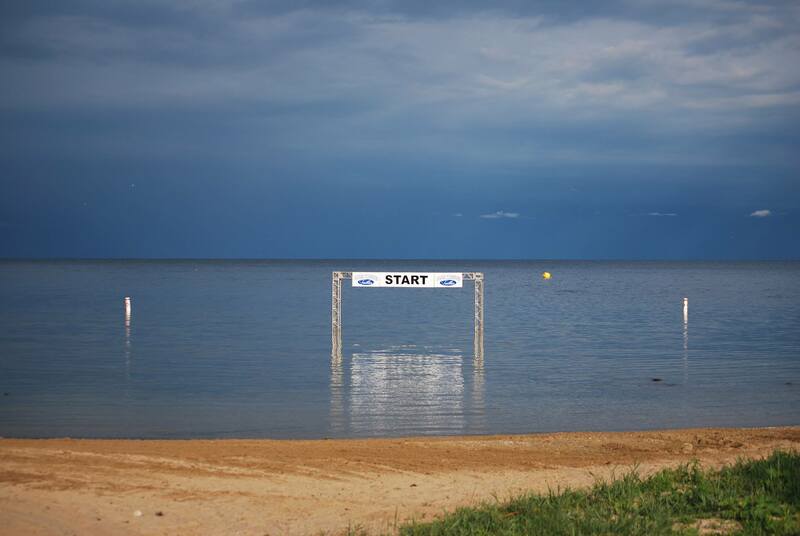 After getting through the chute I had a 100 yard walk/swim to get to the start line. About 50 yards from it the wave started and we were off. I started swimming at that point and added that to the swim. My total distance on the swim was 1.32 miles, official time of 37:26 they say 1:56/100 meters… I got 1:36 per 100 yards, including my extra warmup. Overall, really happy to swim strong and only get hung up a few times with people from other waves. On the way out I filled the wetsuit with water a few strokes from the end and it was easy to get off o n the way up the ramp and standing in front of my bike. Bike, it was mostly a blur. I got headed down bay shore drive for the first 12 miles, got settled in, had some water and nutrition and started past people in the previous waves. With 12+ waves in front of me there was plenty to pass. I needed to stay focused and the first 12 miles were not quite “head-down and go” as I planned. Through Sturgeon Bay required a bit of care as the roads were a bit rougher. Mile 20 came and I was out in the rural area getting ready for the beginning of the hills. I attempted to keep a smooth and easy pedal stroke up as many hills as possible and keep the feet spinning on the descents. Generally I felt good about the effort that I put into the bike through the first half the bike. The second half, I knew there was a couple of bigger inclines and the plan was to hold back a bit more on them to get ready for the run. Although I managed to once again mess up my watch part way through the bike… Total time of 2:33:36, 21.9mph average! 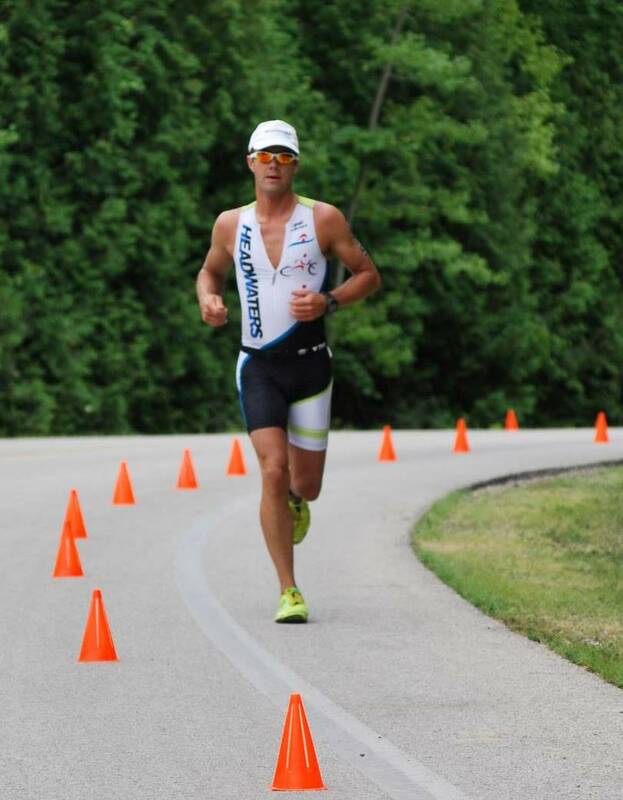 T2, not much to say… I left the shoes on the bike, ran through transition barefoot, fumbled a little bit with the running shoes, grabbed the hat, race belt, and Gu’s and off I went. It was a short line through transition compared to other waves… That might explain my 47 second and 16th fastest overall T2 time. The run, oh the run! All year I felt really good about my run. Leaving T2 I knew my legs were not going to feel super fresh, I dialed it back to 7:45/mile pace for the first mile to assess myself. After the first mile and a half I felt good, no GI issues, the legs were functioning, and the breathing was good. I settled into a 7:35/mile pace until the descent. I don’t know the grade but it was steep and short and tore my legs up. Something I was not prepared for. The next mile did not feel right so I slowed back a bit until the steep uphill at mile 6. I was prepared all along to walk up this hill if the legs were in need of a break. I walked and began running back into town and back toward the second half of the run. I’m not certain were it all fell apart, but I began walking more aid stations and the pace between them slowed to barely a shuffle. Post race, just about fell over as I folded to rest, just about got attacked by a hoard of nurses. 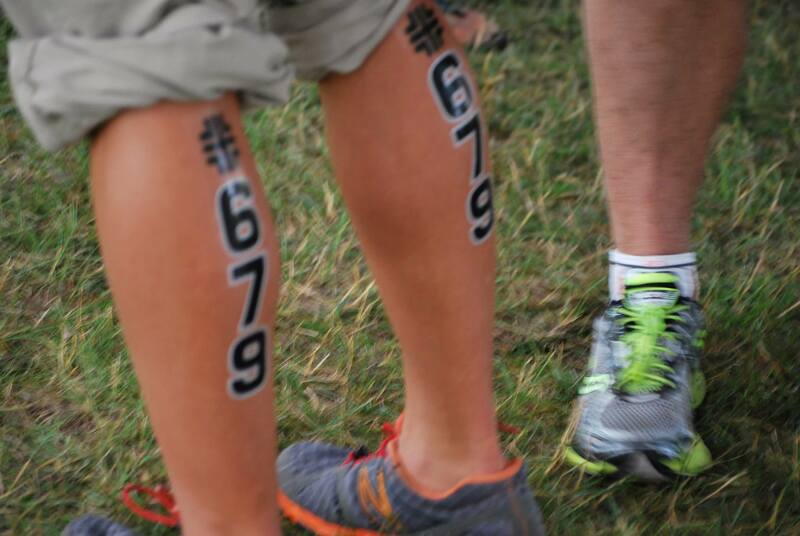 The support at this race was amazing! Found a nice cool towel and stumbled over to the fence to find my wife and parents. I thanked them for being there and made my way to the ice bath for a nice cool dip. After that I was not allowed to make decisions so I followed directions and managed to make it out of the race venue with all of my things. In general I was happy with the race. Yes, I do wish I would have realized my goals but I survive to fight another day. 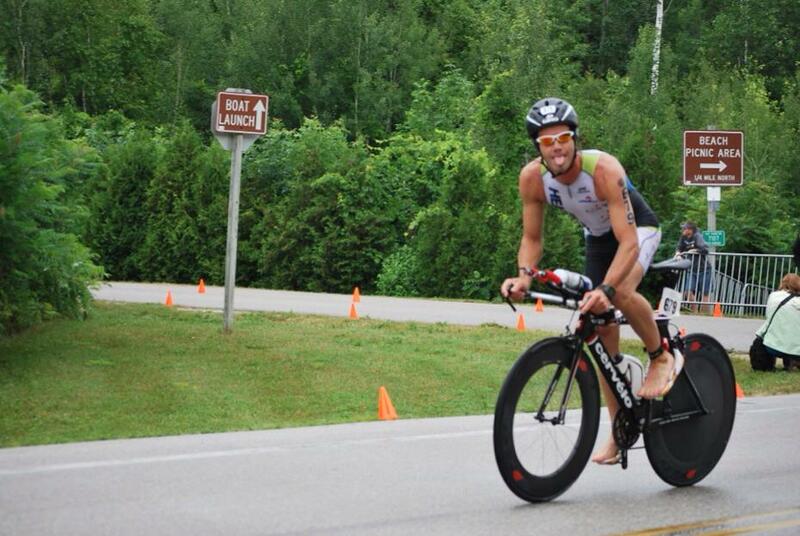 Nevis Northwoods Triathlon, A Race Report – It’s shorter, I promise.